We can create new products much quicker with AWS at our side. Development time is reduced by 30%, and testing and quality assurance can be done 40% faster. ACTi Corporation, founded in 2003, is a provider of end-to-end IP video surveillance solutions with products that deliver both security and business insight through big-data analytics. Historically, the company’s main markets have been in a centralized surveillance systems for small-to-medium sized enterprises and large corporations. Today, ACTi also distributes surveillance systems to retail stores due to the cost-effectiveness of its cloud-based surveillance technology. As part of its worldwide offering, the company provides comprehensive support both pre- and post-sales through a 24/7 global technical team. 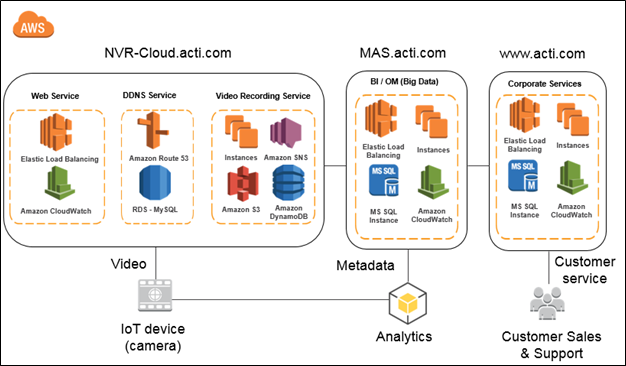 ACTi is developing integrations between its cloud-based surveillance technology and related systems, such as video analytics, forensics, and big data and Business Intelligence (BI) solutions for retail, which helps customers to improve business efficiencies. ACTi recognized the potential for cloud-based IP video surveillance and realized that cloud technology could help customers avoid the cost of deploying large physical infrastructures and maintaining a team of security professionals. ACTi wanted toseize these opportunities and make cloud-based solutions available to companies of all sizes. The company started developing a cloud-based surveillance and big data analytics system, but ran into technical difficulties. These challenges disrupted the company’s own plans to switch its internal systems from on-premises to a cloud-based platform. It had no option but to find a cloud-service provider since the situation limited growth potential and the organization’s ability to reduce operating costs. Peter Wu, sales director at ACTi Corporation, says the company was dedicating an increasing amount of budget to support a 20 percent increase in data per year. “We wanted a cloud-based solution to reduce our IT overhead, but the priority was to develop our cloud-based IP video surveillance solution to drive our market share worldwide,” he says. ACTi successfully migrated its internal systems to the cloud in about two weeks. This included the company website, business intelligence portal, and sales performance data, as well as its customer demo environments. After the successful migration, the company then moved its Cloud NVR, a cloud-based video surveillance solution, and its Market Application Suite (MAS) platform, a big data analytics platform for various vertical applications, to AWS. The company leveraged multiple AWS products, including Amazon Elastic Compute Cloud (Amazon EC2) for computing power and Amazon Simple Storage Service (Amazon S3) for a fully redundant data storage infrastructure. For networking, ACTi uses Amazon Route 53 and Elastic Load Balancing, which automatically distributes incoming application traffic across multiple Amazon EC2 instances in the cloud. It also uses Amazon CloudWatch, which is a monitoring service for AWS cloud resources, and the Amazon DynamoDB NoSQL database service. Amazon Simple Notification Service (Amazon SNS) is used for a simplified, cost-effective way to send push notifications to mobile device users and email recipients. Today, ACTi is expanding its cloud-based solution worldwide to companies of all sizes. Wu says the AWS-based services offer “great revenue potential” for the company as it combines surveillance with big-data analytics, especially with accelerated development cycles. Hortin Wang, IT manager at ACTi, says, “We can create new products much quicker with AWS at our side. Development time is reduced by 30 percent, and testing and quality assurance can also be done 40 percent faster.” With these changes, ACTi has also lowered the cost of product development by around 30 percent, helping to cut overhead, while IT operating costs have been reduced by about 20 percent by moving internal systems to AWS. ACTi customers are also realizing the benefits of using AWS. They no longer have to face the costs and time required to deploy, test, or construct a large physical infrastructure that is traditionally not only the biggest overhead, but is often very hard to estimate in a big IP video surveillance project. Aside from the cameras, the rest of the hardware is able to work immediately in the cloud. For ACTi, such savings have made its solutions far more compelling. Wu explains, “We have been able to reduce customer costs by 40 to 50 percent with AWS.” Furthermore, ACTi is extending the value of its solutions through the continued development of a big-data analytics layer and the integration with third-party solutions that can be applied in retail, quality assurance services, and logistics application. Learn more about how to run big data solutions on AWS.